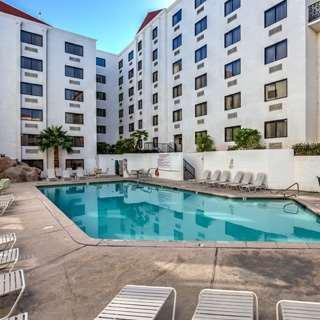 With a stay at Colorado Belle Hotel Casino Resort in Laughlin, you'll be in the business district, within a 5-minute drive of Laughlin Event Center and Regency Casino. Featured amenities include express check-out, a 24-hour front desk, and luggage storage. Planning an event in Laughlin? This hotel has facilities measuring 27000 square feet (2508 square meters), including a conference center. A shuttle from the airport to the hotel is complimentary (available 24 hours). Great place to visit. Amazing location. GREAT parking. Fair for traveling with friends. Close to Colorado River. Good for sightseeing with nearby parking areas. Perfect value for money. Great location and price. The room was great for the price. Terrible cleaning. Rude wait staff. Front desk staff rude. Expensive buffet breakfast. The breakfast buffet was lacking. No hot breakfast. Carpet was disgusting. Room was disgusting. Bathroom floor was filthy. Wi Fi does not work. Room internet did not work. Wi-Fi connection didn't work. Hallway carpet looked old. Trash on the floor. Rude casino staff. Hallway carpet looked old. Carpet is old and stained. Hall carpets filthy. Carpet is worn and dirty. Hall carpets filthy. Bathroom floor was filthy.